HITTING A JUMPER - Pearland junior Alphonso Tyler (3) hits a key jumper for the Oilers in the fourth quarter giving Pearland a slim lead over Strake Jesuit. 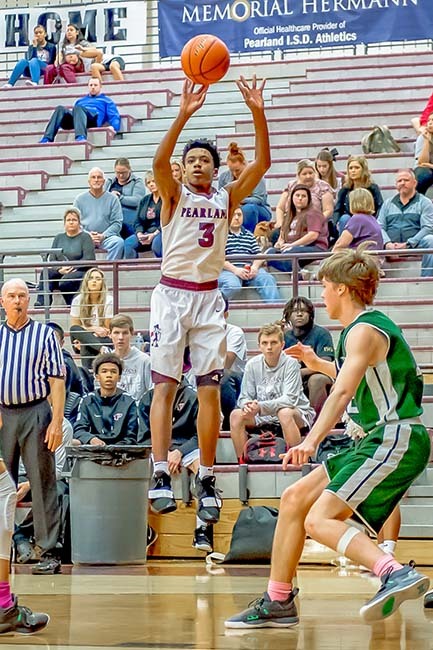 PEARLAND — Lightening struck twice at the Pressure Pit as the Pearland Oilers fell to the Strake Jesuit Crusaders 47-46 on a last second shot in regulation and overtime. The Oilers led 40-38 with only 6.0 seconds left in the game when the Crusaders went the length of the court and scored on a bank shot while driving the basket. Not only did the last second shot tie up the game at 40-40, but the officials missed a blatant charging foul that would have erased the basket and given the Oilers a much needed 40-38 district win to keep them in the playoff hunt. Instead, the two teams had to go an extra four minutes in overtime to decide the crucial league contest. With less than a minute to go, Pearland was trailing 44-43 when Derrick Ardoin hit a clutch 3-pointer to give the Oilers a 46-44 lead with 6.1 seconds left in the game. But the Crusaders once again came quickly down the court and passed the ball to Harrison Bothe who drained a 3-pointer from the wing to pull out the 47-46 shocking win. Jesuit took the first quarter 9-7, but the Oilers hustled their way to a 17-16 halftime after taking the second period 10-7 thanks to five points by Ardoin and a 3-pointer by Javonne Lowery. Both teams battled in the third quarter with the Crusaders winning the frame 11-10 to send the game into the fourth quarter tied at 27-27. The two teams scored 13 point each in the final quarter with the questionable call on the last shot that sent the game into OT at 40-40. Pearland entered the game with a 5-5 mark and in fifth place in the district standings while Jesuit was 6-4 and in a three-way tie for fourth place. Pearland falls to 5-6 while Strake improves to 7-4. The Oilers must now win out and get some help in the final district games if they are going to make the post-season. Ardoin led the scoring for Pearland with 13 points while Lowery added 12. In looking back, the Oilers had the opportunity to seal the game in overtime had they made their free throws. Pearland was 11-of-14 at the line during regulation, but were 0-for-4 in the extra period. Strake never made it to the line in OT. The 3-pointer was a friend to the Crusaders as they hit 9 treys in the game including the game winner.